Three of Pentacles (R) says that trying to “do it all” leads to work-a-holism which is just as devastating to love and creativity as any other excess. You sacrifice many things for the sake of one. You begin to stifle others by imposing standards and values to the extent they can not be themselves. You now have the opportunity to demonstrate and share your work with others – which will satisfy your need for their feedback and approval. You will go much farther with the active support and encouragement of those around you. You have the discipline to work long and hard, but you need to understand the overall plan, otherwise you tend to get hung up in details or caught up in the drudgery of meaningless exertion. Things continue – either getting worse or improving, but at a slow steady pace. Stand back periodically and take a look at the whole picture. Form a mental picture of the completed project. Always strive to learn more, to gain more experience. Challenge yourself to do more and with time and patience, learning to take it easy and not always trying to rush things – you will succeed. You will learn to focus on your ambition and extend the effort necessary to succeed. Perhaps the category of work is wrong. Lack of direction or wrong direction. Productivity is blocked or below an acceptable level. The student/apprentice may not be doing as well learning the trade as he might. Supervision may be too harsh or lacking altogether. There may be some sort of subversion of a productive process. Physical inertia, laziness or over enthusiasm or too much work taking place. The amount of work being done exceeds what is proper or necessary for the desired end product – the mark of a workaholic fits here. In the first position: There will be parallel developments/effects in this lifetime directly as a result of the power this talent possesses. The work will predominate. In the second position: It is hard to imagine how one can be too resourceful, too independent, but that may be what is implied here. It could be that you have much more of these qualities than you have used thus far. In the third position: On the one extreme, the production/ progress will be more than expected and a problem to deal with in itself. On the other extreme, production/progress will be less than expected or hold up production for the moment. Check materials, production process and such. In the fourth position: In one extreme – passion may be excessive. Without balancing with other input/activity to some degree – the work itself will suffer by losing its relevance and vitality. In the other extreme – the passion is not sufficiently honored and not for appropriate reasons. In the fifth position: Perhaps over doing the thinking in physical/material matters. On the other hand you may not be planning enough or about the correct things. In the sixth position: Question of proper progress/conduct in physical/material matters will be of concern. The effect of your physical/material activities is positive but so profound as to require accommodation. On the other hand, the effect may be potentially harmful and will have to be handled deftly. In the seventh position: On the one hand, you may have worries in matters of business or health, but these problems will be more in your head than in reality. On the other hand, you may be too carefree and not paying enough concern to these matters. You may not be meeting the challenges. In the eighth position: Study the reverse meaning – something is affecting your productivity adversely. In the ninth position: The discomfort here may be severe, with vivid, assertive dreams possible. Or, the opposite can be true, that the gut feeling is not correct and that your fears are unjustified. The subject still needs to reach the light, the attention of mind but not for accommodation, for clarification. 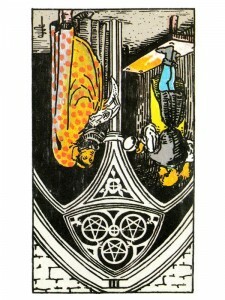 In the tenth position: On the one hand, the matters of the Physical Plane – health, business, etc. are doing so well as to free your attention for the other Planes. (Emotional, Mental & Spiritual) On the other hand, problems with the Physical Plane will rivet your attention there, for positive work that needs to be done. You are so very welcome – thank you for your kind sentiments – they are greatly appreciated. This site, and your interpretation of tarot is my most favorite and accurate and beautiful, thank you so much.